“Effortless” importing of data generated by SoftMAX. Rapid GUI for evaluation of wavelength combinations for noise reduction. Fitting to user-defined functions of up to 8 variables with graphical representation of starting parameters. 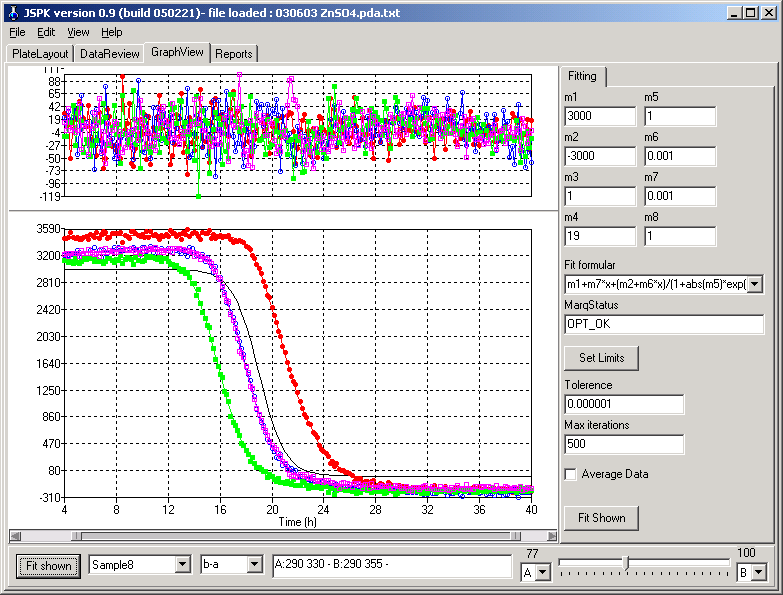 Real-time residual plotting for fit evaluation. Seamless export of raw/reduced data and fitting results to spreadsheet programs. Screenshot below shows the noise-reduced tryptophan fluorescence of four replicate wells during fibrillation of 0.14 g/l glucagon in 50mM glycine/NaOH pH 9.5. The black line is a plot of the starting parameters seen on the top right panel. TPMATH (Delphi version DMATH) by Dr. Jean Debord. TPARSER by Renate Schaaf, Alin Flaider and Stefan Hoffmeister. The software and accompanying instructions are provided "as is" without warranty of any kind. The authors do not warrant, guarantee, or make any representations regarding the use, or the results of the use of the software or accompanying instructions in terms of correctness, accuracy, reliabilty, currentness or otherwise. The entire risk as to the results and performance of the software is assumed by you. If the software or instructions are defective, you, and not the authors, assume the entire cost of all necessary servicing, repair or correction. JSPK is copyrighted software. You may use and distribute it free of charge, but it must not be sold or offered as an inducement to buy other products. Build 050303 - Fixed program to be independent on the type of decimal separator used on a PC. Build 050603 - Quick fix to allow importing wavescan as well as kinetic data. Build 051214 - Implemented MaxDec:=1, to limit the maximum number of decimals on graph to one. Changed web-page reference to http://jspk.phage.dk in the About-box.